Many conservatives on Capitol Hill find themselves left out in the cold by the current leadership when it comes to receiving campaign donations from leadership PACs. CBS’ 60 Minutes aired an investigative report on Sunday by Steve Kroft who interviewed Government Accountability Institute (GAI) President and Breitbart News Senior Editor-at-Large Peter Schweizer which revealed how politicians on the hill abuse their leadership PACs by spending lavishly on themselves. However, when it comes to applying PAC money for its original proposed use of campaign contributions, some members can be downright stingy with their PAC donations. The Center for Responsive Politics reported in early October that House Republican Leadership has raised a massive amount of funds through their various PACs. However, according to Open Secrets, twenty conservative Republican members, who The New York Times identified as a constant “thorn” in Boehner’s side, received very little if nothing at all from these leadership PACs and the National Republican Congressional Committee (NRCC) during the 2012 election cycle. 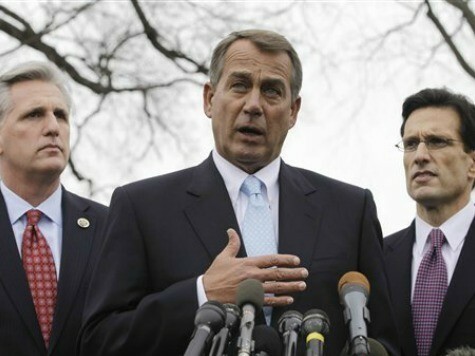 The other top members of the House Republican leadership follow the same pattern. House Majority Whip Kevin McCarthy (R-Calif.) has given just $7,500 combined to two of the 20 (his leadership PAC has given a total of $155,000 to 38 members). Deputy Whip Peter Roskam (R-Ill.) has given $71,000 to other candidates this cycle, but no money to these 20. In the meantime, House conservatives who were snubbed by leadership and their PACs are refusing to raise money for the NRCC in the 2014. “Here at the NRCC we continue to exceed our internal goals and beat our own records thanks to the hard work our dedicated members are putting into growing the Republican majority,” Andrea Bozek, an NRCC spokeswoman, told Politico.